The Aprilia Caponord Rally has to be one of the best looking motorcycles I’ve ever laid eyes on. It looks so tough and the Grigio Safari and Gallaro Dune colours seriously eye catching. With all the accessories bolted on, the Rally looks and is ready to take on the world. 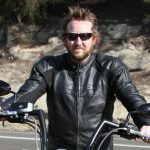 I had the opportunity to do a good overnight ride from Sydney to Mudgee and back on the three Caponord models but I spent most of my time on the Rally. 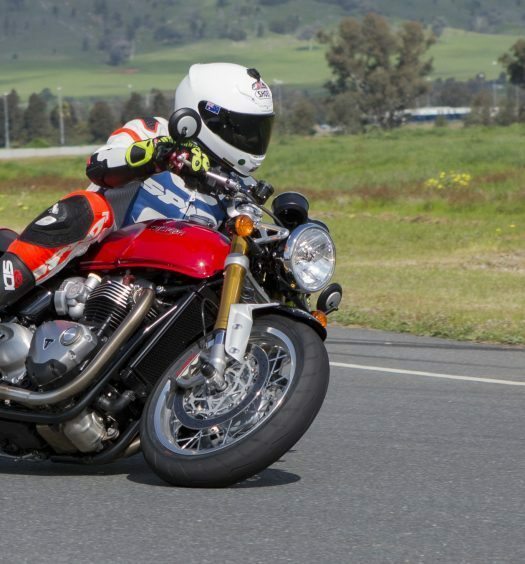 There are loads of accessories available (see Chassis breakout) but the Rally comes standard with the following: Three Ride modes, ABS, ATC, ADD, ACC, panniers, oversize windscreen, hand guards, side guards, LED spotties, spoked wheels. The test bike I rode also had heated grips and a gel seat. Heading out of Sydney in peak hour on the Rally, from Aprilia HQ in the industrial suburbs, we hit peak hour on the freeway and the Rally was quite out of place. Tall, wide and with tall gearing the Rally does not like heavy traffic but it is, at the same time, well behaved and smooth on the Touring setting. I started out with the ADD set to Rider, no luggage and it was a nice plush ride. Once out of town we headed to the Bells Line of Road, where the pace hotted up quickly! The Rally wears Metzeler Tourance tyres, which are fantastic dual sport hoops but more road oriented than knobbys. This means they are fantastic on road and feel similar to the M7s. I had a real go on the winding curves of Bells and found the Rally too soft in the back end, so a quick flick and I increased the shock to two lids and found improvement immediately. 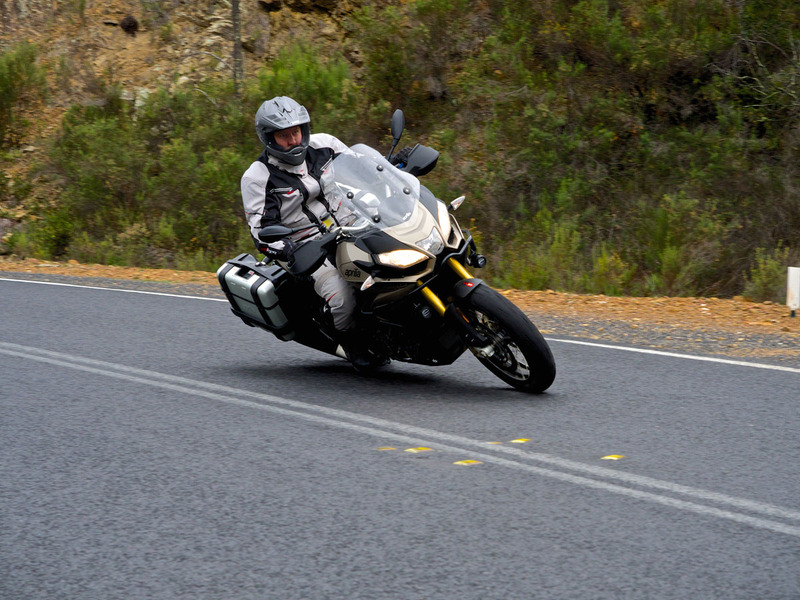 The ADD control is quite good over a wide range of surfaces and although it does get caught out by high speed compression bumps, which will jolt through the ‘bars, overall the system keeps the big Rally extremely well balanced and it truly is incredible how hard this motorcycle can be pushed in a sports riding environment. The front brakes are fantastic and have just the right balance of power and accuracy in modulation. The rear brake I found a tad wooden in feel. The big 19in front wheel, lazy steering angle and 118mm trail makes the front tyre very solid on the road, with a big footprint, promoting confidence, despite the slow steering the Rally can be thrown around, it just needs plenty of input, particularly in the tighter stuff, the only area the 19in wheel felt like a limitation to the bike. Ground clearance is not an issue, although the sides of my boots would touch down it was around the limit of the edge grip anyway, so a good feeler for me. In the open country the Rally is sensational. The oversized screen it great and the bike extremely comfy. The seating position is upright, with a great view, and the wide ‘bars offer good leverage with only minimal vibes coming through. On AUTO the ADD suspension is fantastic and one of the best systems I have sampled. Only when the riding got really serious did I find myself wanting to self adjust it but I could not improve on what AUTO offered. If you compare it to a well set-up manually adjusted suspension system, it is still not quite as good, but the benefit is it will work over a much wider range of conditions so therefore it is a no brainer for me. I would much prefer to have a slight compromise form perfect at all times yet have the ability to ride anywhere without touching a clicker myself! 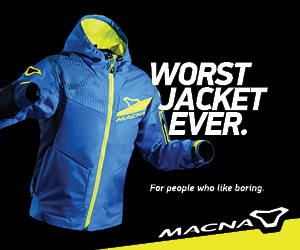 The engine is brilliant, with a broad spread of power and lots of bottom end punch for firing off turns or overtaking. 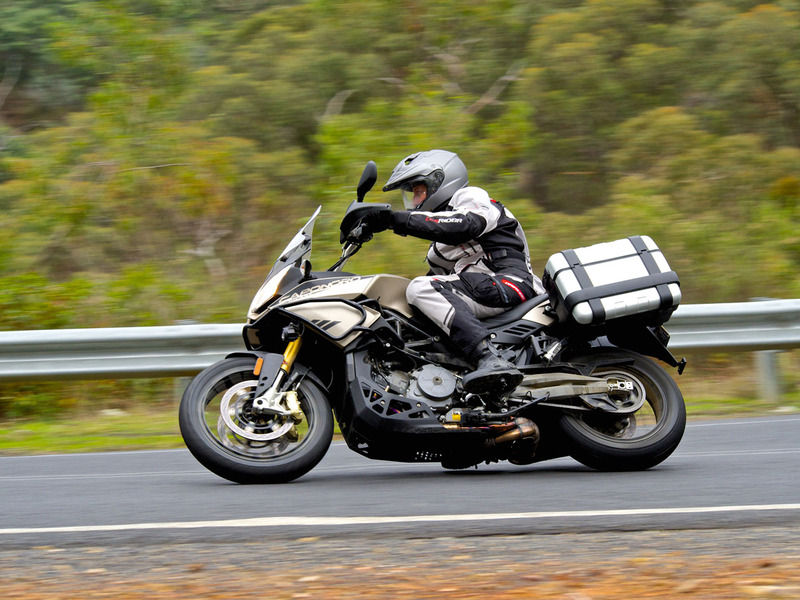 Gearing is tall, great for open roads and taking advantage of the power range of the V-Twin. Cruising at 110km/h sees 4000rpm with lots of torque on tap, and then it all comes alive as revs build towards 6000rpm range before flattening out up top. Gear changes are smooth and the clutch action nice. It’s a flexible, easy engine. I preferred the Touring mode than Sport for all but the tight stuff, where I liked the more snatchy, aggressive throttle for firing off turns with grunt, allowing the traction control on level 1 to hook up the rear tyre and stop me crashing. Then slamming on the brakes and letting the ABS work into turns. A bit like riding a massive superbike, but it all happens a lot slower including the way the ABS and TC cut in. Top fun! The Rain mode is very doughy and soft, perfect for the wet. But overall, Touring is the way to go. Off road the Rally is a very capable motorcycle. I did not take it on any tight trails but did a lot of riding on fast, open dirt roads – very fast (top gear stuff). I found the TC too intrusive so switched it off, along with the ABS initially, but after a few moments I decided that the ABS was better left on and the bike still stopped well. 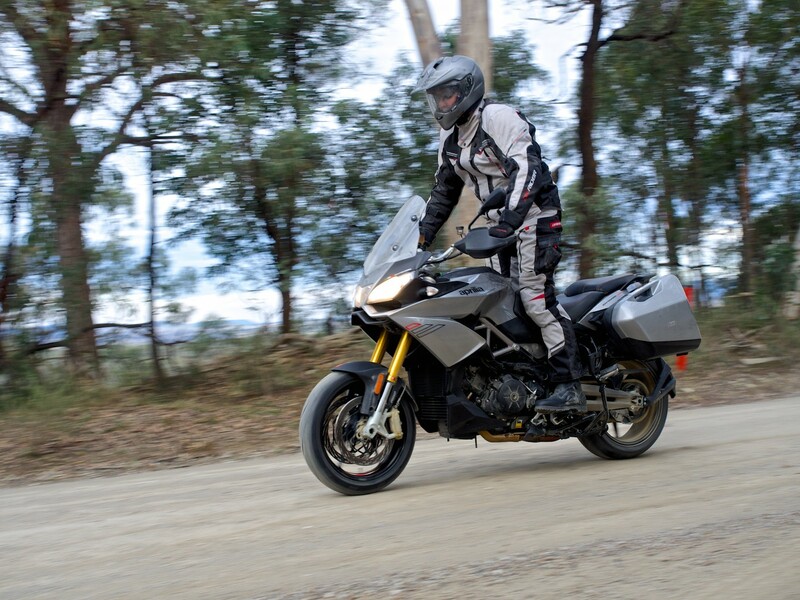 Overall the Aprilia Caponord Rally is a fantastic motorcycle, great value and perfect for the rider who wants to spend 50/50 dirt tar time while touring. 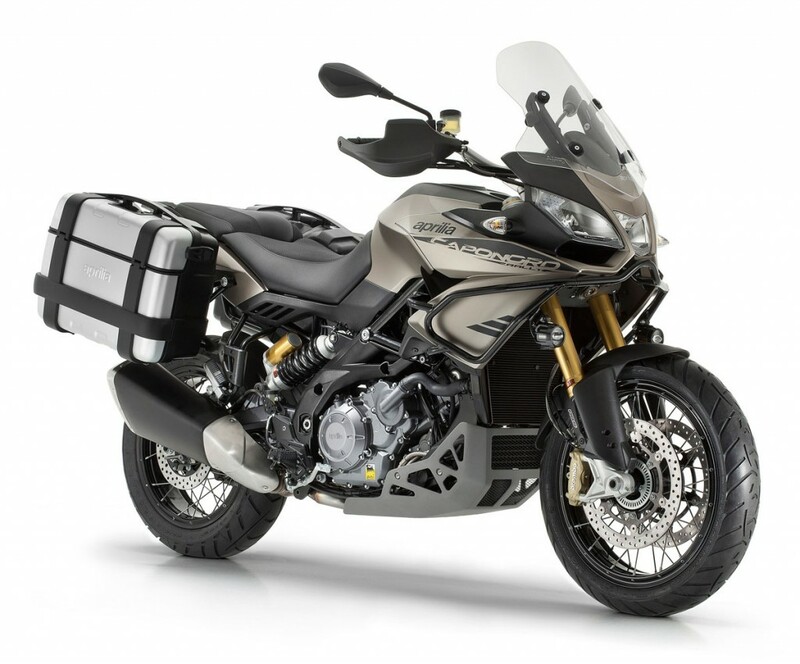 Aprilia have done a great job turning a predominantly road motorcycle into an Adventure Bike. 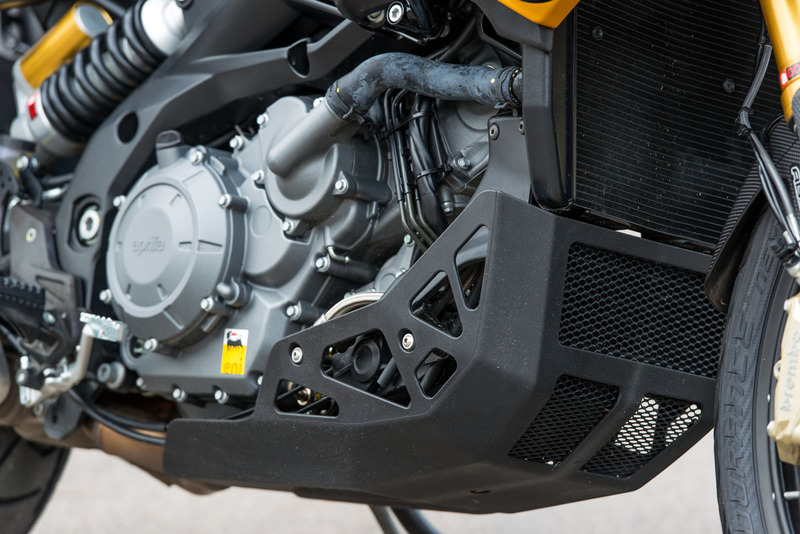 Details from the factory on the Caponord Rally engine are a little scarce but it is a 90 DOHC liquid-cooled eight-valve V-twin, tuned for smooth torque and broad power. The oversquare dimensions of 106 x 67.8mm give the engine top end power but also punch off the bottom, thanks to a high compression ratio of 12:1. Valve sizes are not available, however, the DOHC are driven by a chain and gear combination to give optimum timing and compact design. The engine also has a twin spark ignition and twin multi-hole injectors per cylinder. 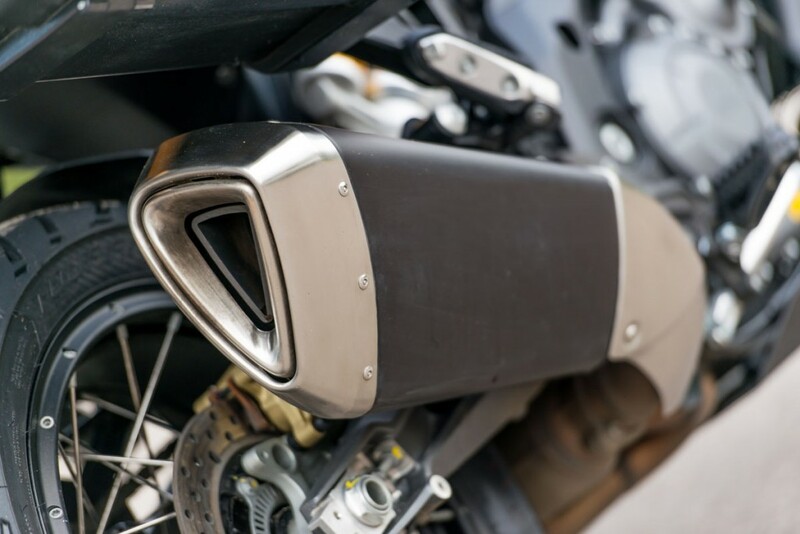 The exhaust system is a stainless-steel two-into-one system and the alternator generates a healthy 690W@6000rpm, enough to drive the various accessories available on the bike. The gearbox is a six-speed unit with ratios 1st- 14/36, 17/32, 20/30, 22/28, 23/26, 24/25. The multiplate wet clutch is hydraulically actuated and the primary drive consists of straight cut gears. 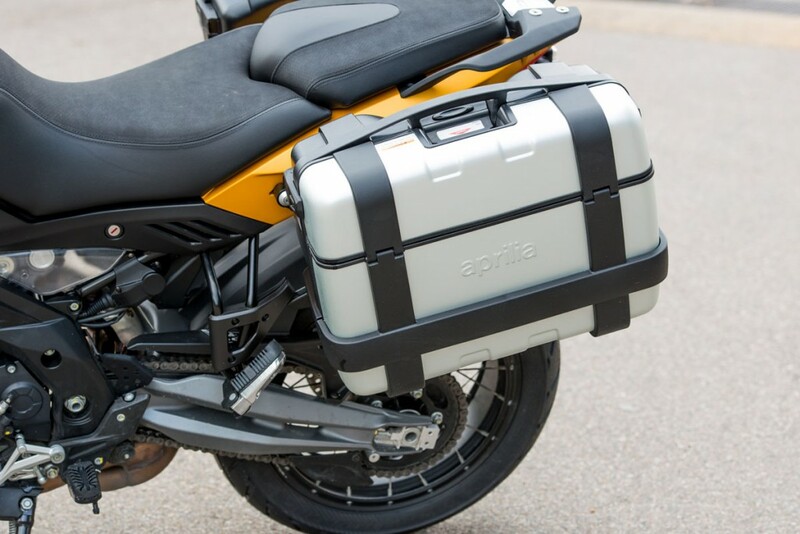 The Aprilia Caponord Rally chassis comprises of a modular tubular steel frame, fastened to aluminium side plates and features a removable steel sub-frame. Forks are ADC equipped Sachs 43mm inverted units while the shock is a Sachs ADC controlled unit. 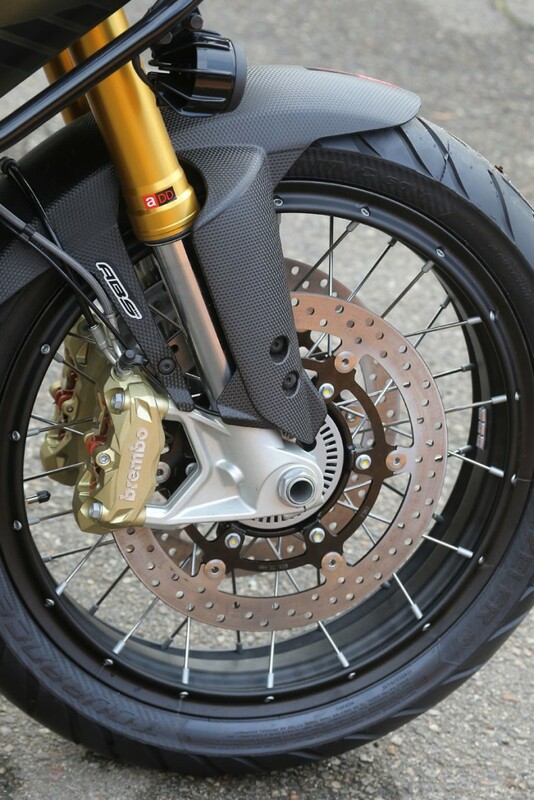 The front brakes on the Rally are Brembo M432 monoblock radial-mount calipers with 32mm pistons, 320mm floating rotors and stainless steel lines at the front, while the rear is a single 240mm rotor with a singe piston 34mm Brembo caliper – all equipped with ABS. Wheels are trick spoked tubeless items, the front a 3:00 x 19in and the rear a 4.50 x 17in. Tyres are 120/70 – 19 and 170/60 – 17. The Caponord Rally has a rake angle of 27.4 degrees and 118mm of trail, with a dry weight of 238kg. 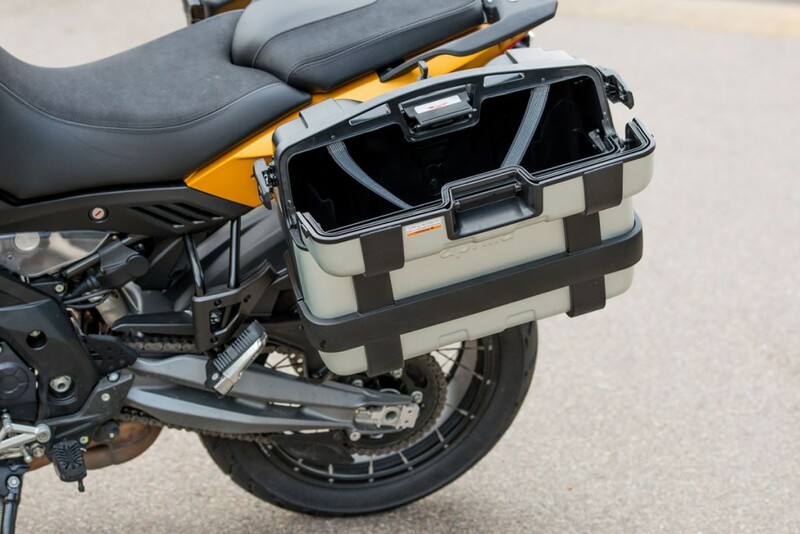 There are lots of accessories available for the Caponord Rally too, including: Arrow exhaust, 52L top box, internal bag kit for luggage, luggage rack, gel seat, offroad ‘peg kit, adjustable rear brake lever, oversize base for sidestand, oil cap, engine guards, LED indicators, alloy mirrors, tail tidy, carbon-fibre front guard, billet levers, reservoir guards, heated grips, tank bag, antitheft kit, smartphone bracket, puncture kit and bike cover. The engine is managed by a complex high tech Ride By Wire system, something Aprilia first introduced in 2002 with the Aprilia Cube MotoGP bike and then commercially in 2007 with the Shiver 750. The system has been refined greatly since then. The Caponord features three riding modes, Rain, Touring and Sport. All the rider needs to do is choose the mode and close and open the throttle to engage the mode. 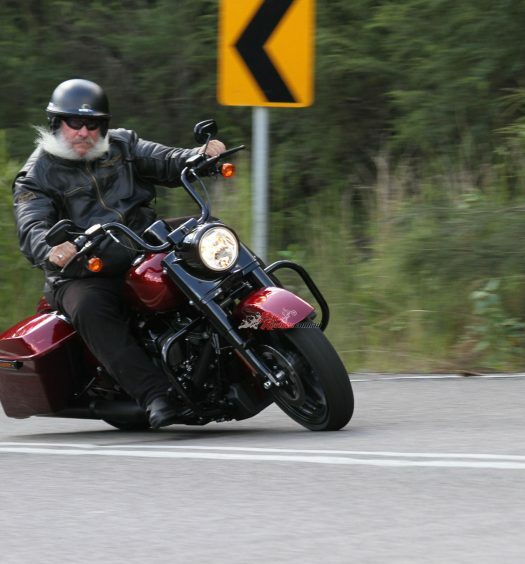 Sport gives a more direct throttle response and power for sports riding. 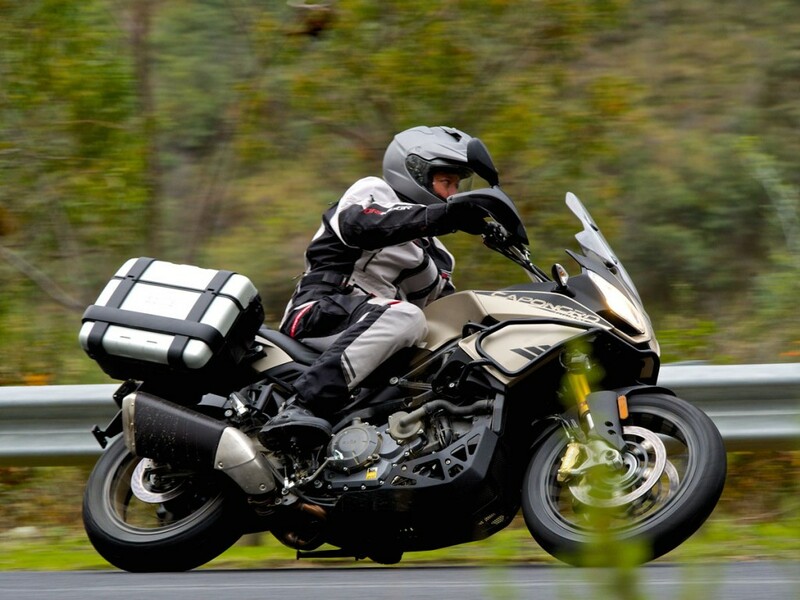 Touring has the same peak power but a more fluid delivers, while Rain limits power to 100hp and gives a smooth throttle. 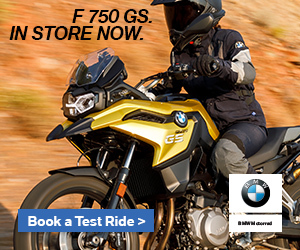 Both the ABS and Traction Control systems can be disabled for serious off road riding. The two-channel ABS system is specifically developed for the Rally. The ATC (Aprilia Traction Control) system was derived from the fantastic aPRC system on the RSV4. It is designed to get maximum drive and grip on any surface, while increasing safety of course. There are three control settings: Level 1 – for pure sports riding. Level 2 – ror city and touring riding. Level 3 – for rain and low grip surfaces. Controlling the suspension is the Aprilia Dynamic Damping system. ADD is a dynamic semi-active suspension system developed by Aprilia. 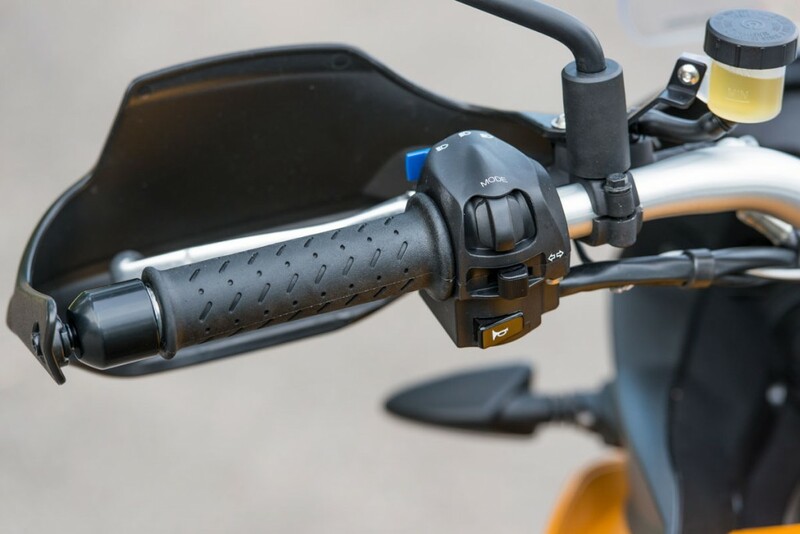 On AUTO it measures real time bumps and rider actions and adjusts the damping of the front and rear suspension in real time to suit the conditions, such as hard braking, soft braking, acceleration, cornering, cruising and so forth. 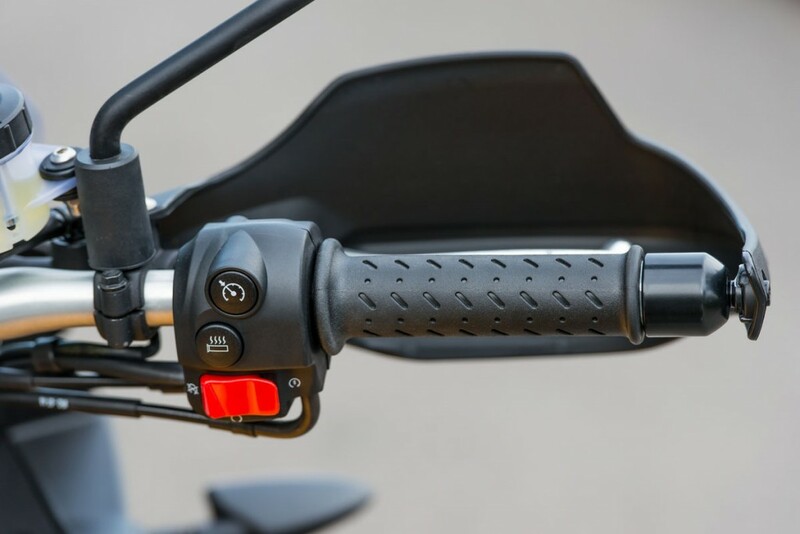 The suspension is also adjustable at the press of a button, including preload, via four pre set settings, Rider only, Rider and luggage, Rider and passenger, Rider and passenger with luggage. Once selected the bike will ‘weigh’ itself and adjust the suspension to give optimum balance and handling. Smart stuff! The Caponord Rally also features Cruise Control and a multi functional LCD display dash and an engine immobiliser for security. ENGINE: Liquid-cooled 90 V-twin DOHC four-stroke, 106 x 67.8mm bore x stroke, 1197cc, 12:1 compression, RbW throttle control with three riding maps and twin injectors per cylinder. Magneti Marelli 7SM twin spark ignition, stainless-steel two-into-one exhaust. ATC (Aprilia Traction Control). CHASSIS: Modular steel cradle frame with alloy side plates, steel sub-frame. SUSPENSION: Sachs 43mm fully adjustable inverted forks, electronic management via ADD (Aprilia Dynamic Damping), Alloy swingarm with Sachs ADD shock. BRAKES: Dual 320mm stainless-steel floating rotors with four-piston 32mmBrembo monoblock radial calipers, braided stainless steel lines (f), 240mm rear rotor with 34mm Brembo caliper. Two-channel ABS.